When Cupid strikes us with his arrow of love, some might say that it can be a painful experience. Some dental patients would argue nothing can compare to a painful dental visit. But what if it didn’t have to be that way? Thanks to dental technology developed in the early 1990’s, laser dentistry makes visiting the dentist less painful and stressful. How? The major cause of dental pain is related to the heat, vibration and pressure of the dental drill. Lasers do not produce heat, vibration or pressure, making it nearly pain-free. If it is the sounds of dental tools are what makes you nervous to visit, the dental laser alleviates this issue by being a quiet instrument. One of the most common uses of dental lasers is as a tool to kill bacteria – the laser is powerful enough to kill bacteria beneath the surface without removing the tissue, this is a way to treat infected or diseased tissue that would otherwise be difficult to reach with normal tools. So, if you really think about it, laser dentistry has given you no good excuse to dodge your dental appointments. The laser is quieter than the drill, allowing the patient to enjoy a more relaxed experience. 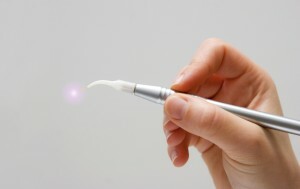 The bacteria-killing nature of the laser and its more precise use can lead to better results and shorter healing times. When used by a trained dentist, the dental laser is a fantastic technical advancement that both patients and dentist can appreciate. If dental anxiety is something that makes you nervous, talk to your dental professional about the use of laser dentistry. If you’re interested in learning more about laser dentistry, contact Dr. Larry Lieberman, DDS at 727-785-8017 to schedule a consultation today. Or visit www.dentist-lieberman.com for additional information. Dr. Larry Lieberman proudly accepts patients from Safety Harbor, Palm Harbor, Clearwater, Dunedin, Tarpon Springs and surrounding areas. This entry was posted in Family Dentist, Family Dentistry, General Dentistry, Laser Dentistry, Oral Health, Preventive Dentistry and tagged Cosmetic Dentistry, Dental Laser, dental procedures, dental tools, Dentistry, general dentistry, gum disease, laser, Laser Dentistry, Oral Hygiene, Palm Harbor FL, preventative dentistry, Restorative Dentist, Restorative Dentistry, tooth decay on February 14, 2018 by admin.